Places to see in Yuksom: Built in 1701 AD, Dubdi Monastery is one of the oldest monasteries of Sikkim located on a hill top above Yoksum. It takes around 45 minutes by walk through the forests to reach the monastery. This forest walk is one of the finest experiences you can have in Sikkim. The trail overlooking Yuksom passes through a dense forest, which is home to some of the rarest Himalayan birds. The mighty Mt. Kanchenjungha and the twin peaks of Mt. Kabru keep peeping through the trees and nearby hills until you reach the monastery. The interior of Dubdi Monastery is lavishly painted with the figures of divinities, saints, demons and other symbols to narrate the religion. A very rare collection of manuscripts have been preserved at the end of the two aisles of the monastery. The two other monasteries in Yuksom are Karthok Monastery located beside the beautiful emerald coloured Karthok Lake and Ngadak Changchub Choeling. Another prime attraction of Yuksom is the Coronation Throne of the first king of Sikkim. In Yuksom, you can still see, the ruins of Norbu Ghang, which is the throne of the first Dharma King (Chogyal) coronated by the three learned monks in 1641 AD who came from Tibet looking for the rightful person to lead the people of this blessed land and start a new Buddhist Kingdom. 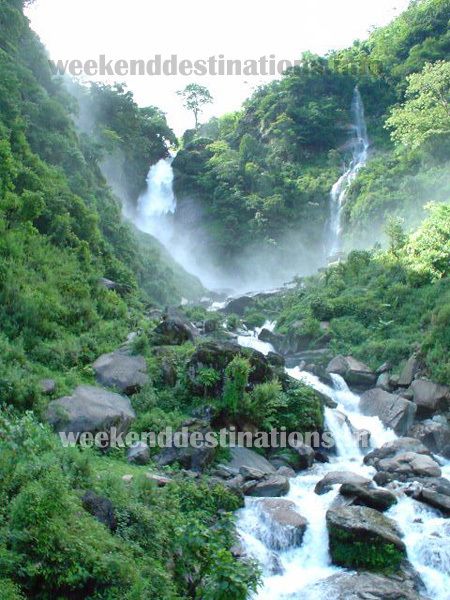 Nearby attractions of Yuksom: Just 10 kilometers away from Yuksom on the way to Pelling is the beautiful Kanchendzonga Waterfalls. This waterfall has its source in the famous Rathong-Chu glaciers at the foot of Mt. Kanchenjungha. 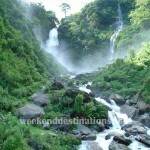 Another magnificent waterfall is Phamrong Waterfalls located around 7 kilometers from Yuksom on the way to Tashiding. 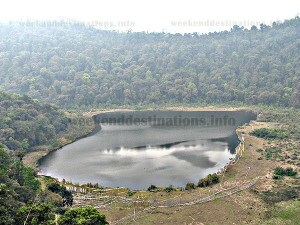 The tranquil and peaceful Khecheopalri Lake, considered the holiest lake in Sikkim is located 27 kilometers from Yuksom. The lake’s contour resembles a left footmark, which is believed to be of Guru Padmasambhava. There is a popular belief that if you pray anything from this lake with pious sole, the holy lake will grant your wish. The Rimbi Rock Garden is a beautiful riverside garden located nearby. A day’s trip around Yuksom would include some great sightseeing options like Tashiding Monastery, Sinon Monastery, Pemyangtse Monastery, Rabdentse ruins and few other spots. Tahiding, located around 23 kilometers away is considered one of the holiest places on earth by the Nyingmapa sect of Tibetan Buddhism. Tashiding literally means “The Devoted Central Glory.” Nestled on a hilltop between the Rathong Chu and the Rangeet River, the monastery was founded by Ngadak Sempa Chempo Phunshok Rigzing in 1641 AD. He was one of the three wise men who crowned the first King of Sikkim at Yuksom. The annual ‘Bhumchu Ceremony’ is held on the 14th and 15th day of the first month of Tibetan Calendar at Tashiding with great pomp. The Pemayangtse Monastery founded in 1705 AD and located around 36 kilometers from Yuksom is the prime monastery of the Nyingmapa Sect of Buddhism. The monastery is world famous for its beautiful Sang-Drok-Pal-Ri, which is preserved on the top floor of the monastery. This monastery was erected for the authentic monks or “ta-tshang”, which means “monks of pure Tibetan lineage”. The ruin of the Rabdentse Palace located on the way to Pemyangtse Monastery is another grand hilltop with a view of the mighty Mt. Kanchenjungha, Pelling and its surrounding areas. Rabdentse served as the second capital of the earlier kingdom of Sikkim from 1607 to 1814. 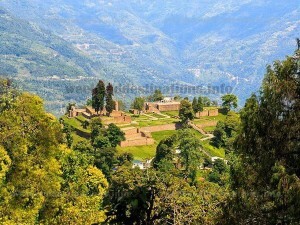 However, the Nepalese army invaded the capital city and now only the remnants of the palace can be viewed at the site. You have to walk for 30 mins to reach the ruins through a well paved walkway skirting the jungles. Things to do in Yuksom: Yuksom is a great place for trekking enthusiasts. It has earned worldwide recognition for the Dzongri-Goechala trek, which makes its way to a base of the world’s third highest mountain – Mt. Kanchenjungha. 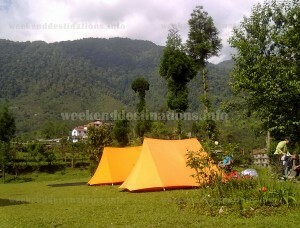 The duration of the trek varies from 5 days to 12 days. Yuksom also offers delight to the avid bird watchers. Yuksom is surrounded by forests and is a haven for varieties of bird species. Monastery treks, Jungle Walks, Bird Watching trails, Waterfall hiking, village walks – Yuksom is a treasure trove for nature lovers and hikers. You can enjoy hiking from Yuksom to Dubdi Monastery to Hungree Monastery to Pokhari Dara and Sinon Monastery. How to reach Yuksom: The closest railway station of Yuksom is the New Jalpaiguri railway station, around 150 km away. The nearest airport is the Bagdogra airport, which is located around 160 km from Yuksom. The place is also accessible from Geyzing by private or shared jeeps. The popular tourist destination of Pelling is around 34 kilometers from Yuksom. 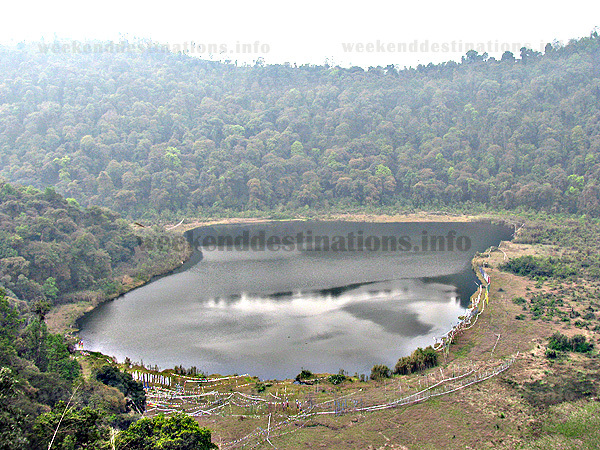 Best time to visit Yuksom: Owing to its pleasant weather condition round the year, Yuksom welcomes tourist almost in all seasons. However, trek enthusiasts are advised to avoid the rainy season. Lodging and dining facilities in Yuksom: At Yuksom, you would find some of the best hotels of Sikkim. Our hotel overlooking Mt. Kabru has 25 grand rooms with elegant wood paneling, spacious modern bathrooms and all modern amenities. The hotel has a private garden, a traditional Meditation Hall set up in traditional Buddhist style at the top floor, Free Car Parking, a la carte restaurant and bar and all other standard facilities like travel desk, shoeshine, overnight laundry, room service and 24-hour electricity. The luxury rooms come with extra large king sized beds and bathrooms with elegant bathtubs. 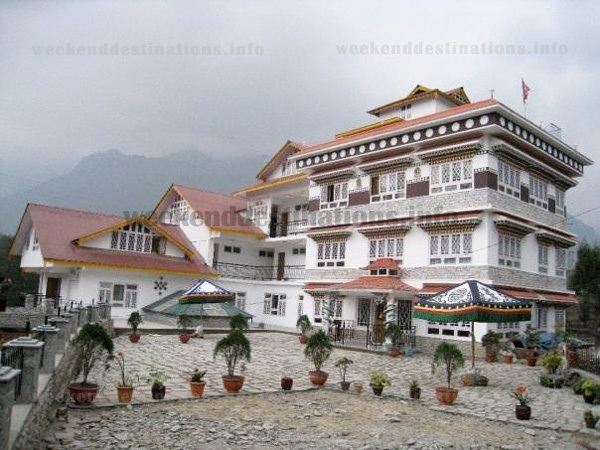 The hotel’s restaurant serves Indian, Chinese and continental food and specializes in traditional Sikkimese dishes. The hotel also has a bar.